Have you ever dreamed of working from home? Are you tired of waking up early in the morning, leaving the house when it’s dark and coming home when it’s dark? Do you wish you could say goodbye to the office for good and work according to your own schedule? Want to work in your pajamas? Guess what! It’s not totally out of reach! In total, I’ve worked from home for a few years and while it isn’t for everyone, I personally love it. I love the flexibility that comes with it, and I love that I can work from anywhere and I’m not necessarily tied to one place. It definitely takes a certain type of person. You need to be self-motivated, organized, and able to work in a solo environment. Important! If you are prone to laziness, get distracted easily and/or need other people or an office-like environment in order to stay on task, working from home may not be the best option for you! 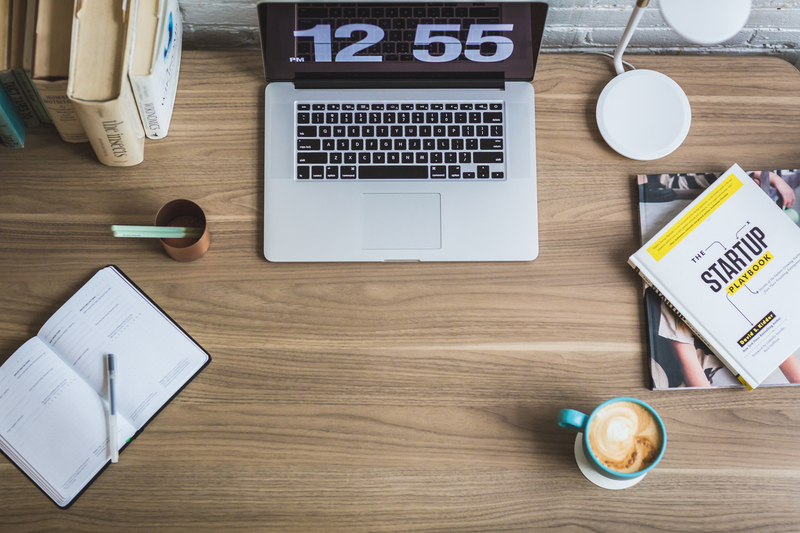 However, if you’re still considering starting a work-from-home position, this blog is for you! Set a schedule – Although you work from home, you should still create a daily schedule and stick to it! This will help you get in the zone and feel like you’re really doing something. Get ready for the day – Yeah, yeah, yeah. “I’m working from home, so why would I bother getting dressed or putting makeup on?” Well, because it’s proven to make you more productive! Just the simple act of putting some jeans on can make you feel much more motivated to get ‘er done! Give yourself a break – I’ll be honest, I don’t do this often enough, if at all. I’m one of those people who needs to finish something as soon as I start it, and then I get on a roll and want to knock out tasks. But that isn’t always the best. Take breaks, give your mind a rest, drink water. Buy 5 planners – Maybe not 5, but you get it. Buy a planner and use it! (This is the one I’m using!) Plan out your entire day and prioritize your tasks. And don’t forget to mark off things you complete, studies show that helps us become motivated to achieve even more! Aside from staying motivated, keeping organized is the most important thing to keep in mind while working from home. 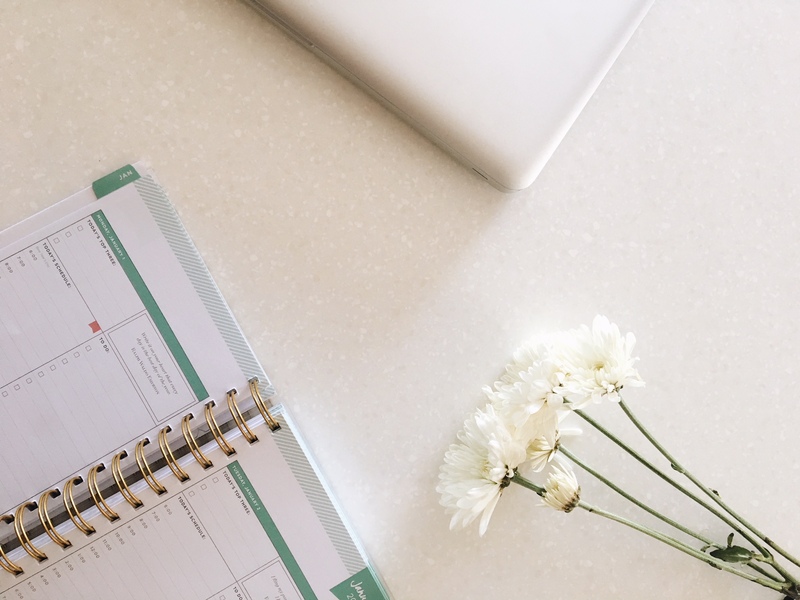 These are my favorite planners and apps that hold me accountable! This one is amazing because it lays out your day by the hour, it has a section for your daily top 3 tasks, and it even has a gratitude box! I love apps, and I’m always downloading new ones to test out. Here are my favorites (so far). Evernote – I wouldn’t survive without a space to jot down all my thoughts, ideas and tasks. Aside from my planners, I need an app to help me keep track of my to-do lists. Evernote is perfect because it syncs with my iPhone and iPad, and it even has some awesome templates that make staying organized super easy! Dropbox – Unless your work uses iCloud or OneDrive, you’re most likely using DropBox to share and upload files. It’s easy, it’s quick and it’s reliable. I use it for my personal work, too! Noisli or Coffitivity or Rainy Café – Yes, I have them all bookmarked and YES I use them all. Each one has different features and sounds a bit different, so depending on the day or the mood I’m in, I’ll choose one over the other. I can’t work in silence, and sometimes music is too distracting, so these sites are incredible when I need a good, calming white noise! Although I don’t work from home, I often have to do work at home and these tips are going to be so great to help to motivate me! Please consider adding SkipTheDrive.com to your list. Thank you! My husband doesn’t care to work from home. There are just to many distractions and other stuff going on. If we had a room or office that was just for work that would be different. It can be tough sometimes, and definitely takes some discipline and a certain type of person! Such great tips. Working from home can be such a joy — but it takes discipline! I’m definitley checking out all these sites because I’ve been wanting to find a remote job for a while now! As a single mother of 2 it would help so much to work from home! Thanks for the post! Working from home is such a luxury, isn’t it? And I bet it can be super helpful especially if you’ve got young ones in the house! I love working from home, and I’m glad to see more and more companies warm up to the idea, too! Yes, it is refreshing that our company is so understanding and flexible, especially for working moms like myself. Thank you for your list! I would like to work from home. I still have one left at home but even if he went to school I would still like to work from home. I juse haven’t found that “real” work from home job yet! Love the tips your provided. I love the idea of creating a space that is dedicated to working from home. I just got a new job in August and one of the benefits is that it’s extremely flexible so I can WFH when I need to. It was DEFINITELY an adjustment period and figuring out my routine. I am starting an apartment search and one of the key factors is I need space for a desk that I can transform into a miniature office space. My planner (I have the same one) also saves me and keeps me sane. I work from home too and always looking for new tips to stay motivated! Also, Day Designer planners are life!! Awesome! What do you do? And this is my first planner from them, and I LOVE it!! These are great tips! I work from home and love it! I definitely feel more productive having a dedicated space. I need to work on a stricter time schedule bc I over-work. these are great tips! since i set up my home office i feel so much more productive! I will go into it even just to answer emails! Great post! I work better when I create my own schedule and have a dedicated ‘work space’ (even if it’s my desk in my room haha). Thanks for sharing this! What a helpful post. I have been looking for freelance work (from home) and this post came in at the right time. Thank you! It’s my dream to work from home! Thank you for sharing. Thanks for sharing such an informative post, I work from home part time so your post was on point for me. I totally agree, setting up your work space and having a planner come in handy. You’re spending most of your day at your desk you want to make sure everything is where you need it to avoid getting up and sitting back down. I try and have snacks handy to stop me from constantly peeking in the kitchen. I’ve never heard of noisli or rainy cafe but I checked them out and they are really cool. You’re welcome! I love those sites for when I need noise, but music is just too much, you know? I need to check out your links suggested as I’m a real disorganised mess whe it comes to working from home. It all happens but it’s the how I need to fix! Thanks for showing me the way. Just bookmarked this page! Such great tips on where to find remote jobs, thank you for sharing! I work from home office.Sometimes it is distracting to work with the kid.But,I finish my all important stuff in the morning when the kid is at school.Afternoon is for other things which I don’t want to concentrate more.I also believe in proper dressing up for the work though I work from home. Great tips. I teach part time, but I just started a remote writing position as well. I definitely agree with you about actually getting ready for the day and having a dedicated space. Those two things can make all the difference. I’ll also be checking out some of those links! I hope the links are helpful for you! Excellent tips! There are disadvantages to working at home. It takes a lot of self-discipline. Thank you for following BrewNSpew. You have some great advice for this hear. I occasionally work from home although my job is not that conducive to it most of the time. But I find I need to set alarms and give myself breaks and then stop working when I’ve put my day in. I tend to start earlier and work later when at home. I also tend to not move as much, and get a bit slouchy through the day. I found what you wrote great until you said planners and then I switched off. Surely that’s just another task? Wow, thank you so much! I really appreciate that! And I’m glad you agree, I might make an updated one of these posts because the longer I work from home, I pick up on new habits and new tricks that make it easier.